I just love coming across really unique handmade products, and I certainly think that Cody has got a fantastic thing going here. In a child's world of battery-operated, plastic toys, I love coming across children's gift ideas that are handmade and special. Lu & Ed is also environmentally friendly - what more could you ask for? Hi hello! I make unique, one of a kind storage solutions for kids in the form of Mon-stors! Mon-stors can be hung from a door, in a car, in a closet - anywhere extra storage is needed! - and then kids can "feed" their monster toys, laundry - anything your monster has an 'appetite' for and you need extra storage for! Also great in the kitchen to hold plastic bags, or in the car to hold diapers and wipes + a change of clothes for babies. 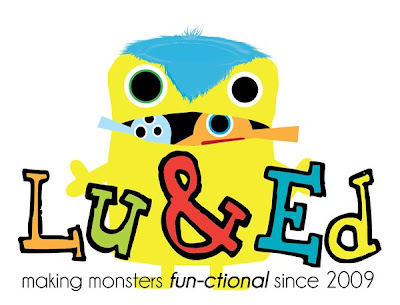 I have been making Mon-stors for three years and strive to make Lu & Ed as green a business as possible - I buy most of my monster materials (90%) at thrift stores, I ship in recycled boxes, and I use fabric scraps to stuff monsters or dog beds I donate to animal shelters. These are so awesome! What a great idea, this might actually get kids to pick up. I know I would! ♥ thanks! :) Kids really do love feeding their Mon-stors toys - I mean, no one wants to go to bed with hungry monsters in the room! Cody, we have something in common, we share love for monsters! Your creations are so adorable and perfect for kids because, kids love to hide things all over the house. ♥♥♥ Thank you so much, Snuggly! :D Congrats, it is so great to be in this great event with you and the other fab artists! So much talent! Hi Cody, these are the most creative product I've seen in a long time! You must have so much fun designing + making them!! Congrats on the great feature. I do have so much fun creating each one! I love dreaming up their personalities while I sew! ♥ Thank you for stopping by and supporting the Handmade Marathon!